This was first featured on Space Wolves Blog in 2009 so is in need of an update. We are posting here for remembrance more than anything and will have an updated guide very soon. The points will not be correct any longer. What are the best weapons for my Wolf Lord? Read our Wolf Lord guide to find out! This Wolf Lord guide were the first in a series of Space Wolves unit guides written by Jim and Adam in 2009 to help you to build the a ferocious and cost effective Space Wolves army. Armed with the philosophy of getting real ‘value for points’, we’re going to explain whether you should splash out on the hard hitting special weapons or keep things cheap and cheerful. 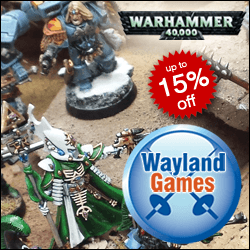 Sometimes we’ll give you a selection of well rounded options to choose from to fit your playing style or the amount of points left in your army list. So without further ado, let’s get started on the Wolf Lord, effectively a Grand Master of the Space Wolves. The Wolf Lord weighs in at 100pts with a fantastic stat line, a close combat weapon, a bolt pistol and a huge list of equipment to choose from. 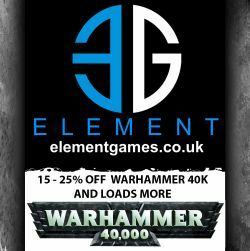 Storm bolter – good and cheap! Combi-weapon – also good and cheap! 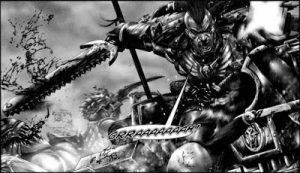 Wolf claw – for 5pts more a power weapon with rerolls! Better than the power weapon. Powerfist or Frost Weapon – Powerfist is no good, Frost weapon is a +1S power weapon. Runic Armour – expensive, especially when terminator armour is more cost effective. Jump Pack – only if joined to Skyclaws. Space Marine Bike – high movement, +1T. Not too expensive. Thunderwolf Mount – gives rending and +1T and cavalry movement. Thunderwolf or bike? Wolftooth Necklace – Take it! Wolf Tail Talisman – Take it! Mark of the Wulfen – Not worth taking for characters. Belt of Russ – 4+ inv save. For 5pts more take a Storm Shield and get a 3+ inv save! Saga of the Beastslayer – Brilliant value for points! Saga of Majesty – you’re playing Space Marines, why bother? Saga of the Warriorborn – Awesome, but expensive. Saga of the Bear – Can’t be instant killed. Expensive. Debatable if worth taking. Okay, having been through the options, I’ll detail the weapons I think are worth taking and present a couple of equipment combinations. The Wolf Lord is in command of Space Wolves Company, so the urge to go completely crazy and festoon him with badass equipment is really tempting. I can see a lot of people wanting to give him Saga of the Bear to keep him alive. But in truth, if he gets pumelled by a Powerfist, eaten by a Monstrous Creature or hit by a Lascannon, then he deserves to die, because you didn’t play him very well. Chances are, he was going to suffer 3 Wounds at this point anyway. 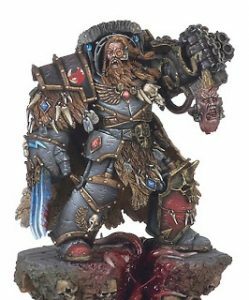 So when it comes to designing our Wolf Lord, let’s think of his battle field role and how he will be arriving. A Wolf Lord will arrive either in a Drop Pod, in a Transport, on a Bike or on a Thunderwolf. And he should always be leading a unit. If he’s arriving via drop pod, rhino, razorback or preferably Land Raider, your Wolf Lord will need something to shoot with and something to fight with. Essentially he’s a melee character with some excellent ballistic skill. So he needs to be protected with armour while making the most of his high Attacks and Initiative stats. Terminator armour is a must have for that 2+ save and 5+ invulnerable save. Don’t worry if he can’t ‘sweeping advance’, because he’s going to kill absolutely everything! Terminator armour comes with a storm bolter and powersword, but he needs something with a bit more clout. +5 pts turns the storm bolter into a combi weapon. Combi-melta or combi-plasma will make the most of his Ballistic Skill. Meanwhile for +5pts he can upgrade the power weapon to a Wolf Claw and choose to reroll to hit or reroll to wound. Saga of the Beast Slayer is a must at just 10pts for all those Toughness 5 models. Couple it with the Wolf Claw and you can re-roll to hit and re-roll to wound every time! Terminator armour, combi-melta, wolf claw and saga of the beast slayer. For a few points more, you can swap the combi-weapon for a wolf claw and swap the left wolf claw for a Storm Shield and get a 3+ save. Terminator armour, wolf claw, storm shield and saga of the beast slayer. Finally for a few more points, he can have a Thunderhammer. I don’t feel that he needs one because someone in the squad he’s leading should have a powerfist for tanks and tough things. I’d rather keep his Initiative 5 for inflicting lots of wounding power weapon attacks to prevent the squad he’s leading from taking wounds from enemies with Initiative 4 or less. Terminator armour, thunderhammer, storm shield and saga of the beast slayer. Bike or Thunderwolf? If you have a unit of Swift Claw bikers, it’s best to put your Wolf Lord on a bike. If you have a unit of Thunderwolves, then it’s the perfect time to put your Wolf Lord on a Thunderwolf. You may think that your Space Wolves commander is safe on a Thunderwolf all on his own, but he’ll soon drown in heavy weapons on Turn 1. There goes your 200 points character. Personally, I’m in favour of the Space Marine Bike. While the Thunderwolf may grand +1 Strength, +1 Toughness and +1 Attack, it’s not quite as reliable as a unit that can Turbo Boost 24″, gaining a 3+ invulnerable save -and all for 10pts less. Let’s start on the essentials. Your Wolf Lord needs to be protected with either a 2+ or invulnerable save. Runic armour isn’t cheap, neither is the Belt of Russ, but for an extra 5pts, you can take a Storm Shield and get a 3+ invulnerable save. Coupled with the 3+ Turbo Boost save, this seems like a healthy compromise. That leaves 1 hand free for a close combat weapon. This time you have the choice of a power weapon (rubbish! ), frost blade (more like it), a wolf claw or a thunder hammer. Obviously the power weapon is rubbish when the frost blade is just 5pts more for +1S, the wolf claw is another 5pts for rerolls and then there’s the expensive thunder hammer. I’m going to go with the Wolf Claw combined with Saga of the Beastslayer for rerolls to hit and rerolls to wound against anything with a Toughness of 5 or above. Finally some 5pts melta bombs should make tanks a push over. Space marine bike, wolf claw, storm shield, melta bombs and saga of the beast slayer. Thunderwolf, 2 Fenrisiam wolves, wolf claw, storm shield, melta bombs and saga of the beast slayer. As the charismatic leader of your Great Company, it’s easy to pour points into a Wolf Lord. But when there are more affordable HQ options available, he may not always be worth taking. This is because you’re already paying for a 4+ Invulnerable save in his base points cost. So buying him a Storm Shield means you’re paying more points than you should for that 3+ Invulnerable save. But, if you’re determined to take a Wolf Lord regardless and pay that 50pts premium for +1 Weapon Skill, +1 Attack and +1 Wound, read the Wolf Guard Battle Leader entry, because their best builds are the same.